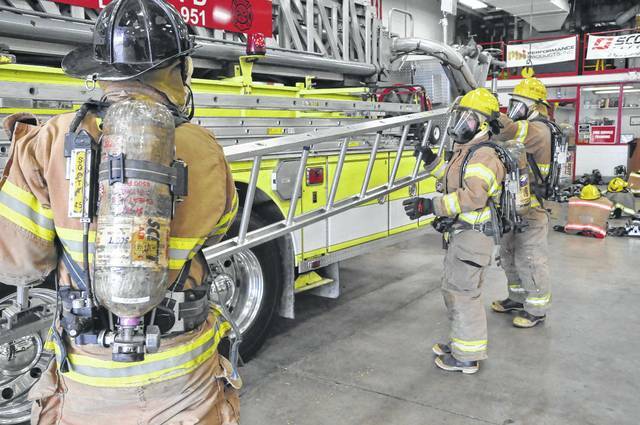 The City of Columbus Fire Department recently donated 75 self-contained breathing apparatus (SCBA), 100 face pieces, and five rapid intervention crew packs to the firefighting students at the Delaware Area Career Center. DACC Firefighting Instructor Kevin Murphy said the SCBA packs are the equipment that firefighters breath through when they enter a burning building to avoid inhaling dangerous matter in the air and said that the students in the firefighting program at the DACC use the real equipment when training. Murphy said the packs aren’t cheap and typically cost close to $5,000 for the SCBA and a face piece. He said the massive donation from the Columbus Fire Department saved the DACC between $500,000 and $600,000. Murphy said the firefighting program roster has 25 juniors, 16 seniors, and 29 adult students and said the students will now be able to use the same packs every day instead of having to rotate the packs between classes. Joseph Hibbits, a senior from Centerburg High School, said that each student having their own pack is a huge improvement because it cuts down on the amount of time spent each day just re-configuring the equipment used by previous classes. Murphy said many pieces of equipment in the firefighting program were donated — from the fire trucks all the way down to the face pieces. One advantage to using donated equipment, Murphy noted, is that it gives students hands-on time with the equipment professionals use. According to Murphy, the Columbus Fire Department also donates equipment to many schools in Central Ohio and said they don’t throw anything away. Murphy said the donations are also a positive for Columbus because many firefighting students will gravitate towards the City of Columbus Fire Department when looking for a job. “It’s an advantage for both parties,” Murphy said. Murphy said the equipment will last a few years because the students use it during many exercises and it has to endure running into cement, gravel, carpet, and metal constantly. Senior firefighting students Joseph Hibbits, left, Hannah Hayslip, center, and Parker Shope retrieve a ladder Tuesday while wearing self-contained breathing apparatus equipment donated by the City of Columbus Fire Department. The students can change from regular attire into their full suit in less than two minutes. 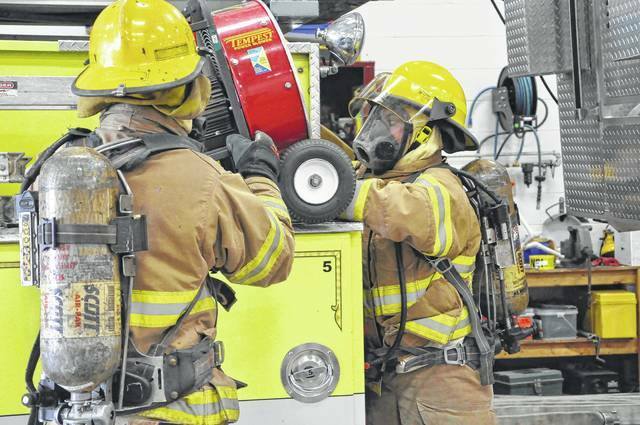 Hannah Hayslip, right, and Parker Shope unload a negative pressure fan from the back of a fire truck in full gear Tuesday during an exercise. Fire instructor Kevin Murphy said all of the equipment used in the DACC firefighting course is donated from various local fire departments.